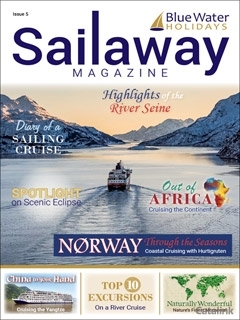 View the Sailaway Magazine 5 Online Brochure Now! Issue 5 is crammed full of entertaining articles including a review of one of their best-selling cruises in Asia, Viking Cruises’ Imperial Jewels of China, plus a Diary of a Sailing Cruise in the Caribbean. Closer to home, they have highlighted the changing seasons of the beautiful Norwegian coast in an exciting feature. They have also picked out their ten favourite excursions to do on a river cruise, with some surprises thrown in!